Catalogue of the available Ruckers papers. Prices of machine-printed Ruckers papers. "Ruckers instruments are decorated to produce a visual effect that is as rich as the aural. The case and lid exterior were painted either with a rather simple imitation marble, or with an imitation iron strap-work, brass studs and large semi-precious stones against a marbled background. Most of the interior surfaces such as the soundwell and keywell were decorated with block-printed papers, and the interior of the lid, if not also ornamented with paper patterns and Latin mottoes, was painted in oils, often by one of the great Flemish artists of the day. The soundboard and wrestplank were decorated with paintings of flowers, birds, insects, scampi and occasionally with a small scene depicting human or animal figures. The focus of the soundboard is the gilded rose surrounded by a floral wreath. This rose, along with the date painted on the soundboard or wrestplank, identified the maker and the year in which the instrument was built. The case sides, the tops of the keyblocks, the jackrail, and the keyboard and lid battens were decorated with shellacked ogee, ovolo or composite mouldings which were sometimes partly painted over with red or black lines, and the keyfronts were decorated with Gothic-pattern embossed arcades in paper and parchment." "The decorative paper patterns used by the Ruckers family, and probably by most of the instrument makers in the Guild of St. Luke, are printed from wood-blocks and are usually in the shape of long strips. These strips were joined end to end to form a continuous pattern which covered most of the interior surfaces except for the soundboard. The paper onto which the patterns were printed was made by hand one sheet at a time. The raw material consists of linen and cotton rags beaten and mixed with water. The pulp mixture was brought into a vat where it was kept in a state of agitation by a kind of paddle or hog to ensure even mixing. The paper-maker or vat man picked up a layer of the pulp on a mould consisting of a mesh of fine parallel wires tightly stretched or 'laid' between the sides of a wooden frame. The wires of the mould are close enough together to retain the fibres on the upper surface, and far enough apart to allow the water to drain away. It is these wires with the occasional transverse chain wires, onto which the pulp collects more or less unevenly, that produces the characteristic ribbed texture of hand-made paper. The paper produced by this method and used by the Flemish builders is of an extremely fine quality without any coarse fibres and with little surface texture. It is quite strongly sized so that the ink does not bleed into the paper. The thickness of the paper which they used is about 0.085mm to 0.12mm, with a weight of about 60 to 70gm/m2. The exact type of ink used to print these papers is not known. However, the standard ink used during this period consisted of lampblack or powdered charcoal ground in a linseed-oil varnish. The fact that boiled linseed oil made a good varnish with good binding and drying properties was already known to Flemish painters in the fifteenth century, and paints based on it were used during this period for inking wooden printing blocks. It seems almost certain that the papers were printed in a press, as press printing had superseded manual rubbing of the blocks or type as early as 1440, and since the linseed varnish inks were used for letter-press printing it is likely they were also used to print the blocks. The patterns were cut into the surface of a plank sawn piece of hard, even-textured wood. Blocks dating from the period in which the Ruckers were active in the Plantin-Moretus Museum Collection in Antwerp are made of pear, apple, cherry and box. Because the wood is cut plankwise, the cutter has to pull the knife toward himself. The technique of wood engraving was a later development and is done on end-grain boxwood using a graver pushed away from the cutter. During printing the part of the block cut away is not inked, and the pattern printed results from ink transferred from the uncut flat sections of the block onto the paper. Obviously the patterns consisting of a black background with the pattern in white were quicker to cut than the corresponding negative pattern since less wood had to be cut away, and this may explain the rather large numbers of this type of 'black' pattern." "The block-printed papers, in addition to being used inside the main lid, lid flap and keywell flap, were put to a number of other uses. As already mentioned the keywell was decorated with one of the wide paper patterns. In the large virginals and single-manual harpsichords this is often one of the dolphin patterns. These are sometimes called a 'seahorse' pattern. However, the seahorse (Hippocampus hippocampus) was not discovered until the mid-eighteenth century, so could not have been the inspiration for these patterns. The dolphin pattern was, however, not used in the keywell on double- manual harpsichords or on the smaller virginals. The most common double keywell patterns are Type 12 [not a pattern produced by me] in Andreas instruments, and 21 or 22 in Ioannes doubles. These patterns fit quite well onto the narrow nameboard, and on the spine and cheek part of the keywell, the papers are placed side by side with the rope or chain edging removed so that only the central portion of the paper is used. The smaller virginals which have narrower case sides use one of the narrower patterns such as Type 12 in the keywell and on the faceboard. Click on this image to see some details of the keywell decoration in one of the Ruckers virginals that I made years ago. In the child virginals the whole of the outer case is covered in a paper pattern and Types 5 (or 5a) or 12 are often used. An interesting variant is the child part of the 1610 HR double virginal in Brussels which has two strip patterns still joined together. Paper Types 24 and 28 are both taken from Sylvius where they occur together on the same page one above the other. And this is the way they appear on the virginal. Clearly when the pattern was taken from the Sylvius book, the page was left as it was and glued face down to the block. The extra leafy arabesque designs were added on either side, probably by cutting them from a second copy of the Sylvius pattern book, since the added arabesques are slightly different from one another, although each is identical to one of the internal arabesques of the pattern. The narrow strip patterns are used to decorate the soundwell on the interior case sides above the soundboard. One of the most commonly occurring soundwell patterns is the Pellegrino pattern Type 13. In the large 6- and 5- voet virginals the faceboard and keywell are lower than the case sides and a narrower strip pattern has to be used on this part of the soundwell than on the spine and sides of the instrument. Thus for these instruments two different papers are used in the soundwell. 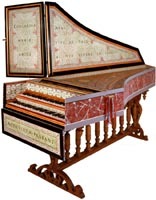 The harpsichord jackrails are also decorated with paper patterns (the virginal jackrails bear the maker's signature and are therefore not papered). The double-manual jackrails are wider than those on singles and strip patterns of the appropriate width are chosen to suit. The lower-manual batten on doubles is papered, and often the top of the lid on the virginal toolbox and the top of the block at the bass end of the upper-manual keyboard in doubles are covered with a section of one of the paper patterns. Although the keyblocks (only the lower-manual keyblock in doubles) usually have a design painted on them in Ioannes Ruckers harpsichords, the keyblocks are often decorated with one of the narrow strip patterns in harpsichords signed by Andreas Ruckers." "Rather surprisingly nothing seems to have been done to protect the papers from damage after they were applied. Many of the papers have since been covered with a protective coat of varnish, but the large number of instruments which survives with untreated papers indicates that the papers were applied and then left to fend off the ravages of time without any additional protection. - - - most Ruckers clavecimbels probably originally had papered lid and keywell flap decorations. The interior lid decoration consisted of the 'silk' or wood-grain papers with Latin mottoes written across them, and these were surrounded by a strip paper pattern, then a strip of clear shellacked wood, and finally a border next to the edge of the lid painted in black. The joins between the interior wood-grain paper and the strip border, the strip border and the shellacked wood, and the shellacked wood and the black outside border are each covered by a thin (3-4mm wide) red line painted in a water-soluble vermillion paint. About 12 to 15mm inside the edge of the paper strip pattern there is another 3-4mm wide line painted in black around the inside edge of the wood-grain papers. (Occasionally this line is painted in vermillion, in which case the printed strip paper edges are covered with black paint instead of the usual red.) 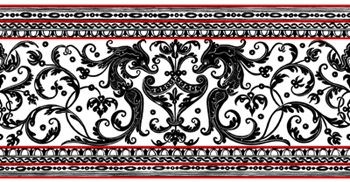 The corners of these thin edgings, whether black or red, are elaborated with a trefoil, a tear-drop, or some other ornament depending on the decorator and period in which he was working. 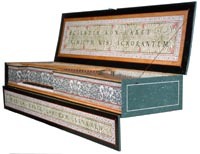 In single-manual harpsichords the lid flap is a flat surface like the main portion of the lid and is decorated in a way similar to the main lid. In double-manual harpsichords, the lid flap is framed with a heavy moulding with the flat surface of the lid recessed below this. Here the printed strip pattern touches the inside of the moulding and the wood-grain pattern fills up the whole of the area inside this. The edge of the strip pattern next to the moulding is not painted over with a thin line, but the rest of the papered surface is decorated like that of the main lid. The keywell flap is decorated either with one of the wider paper patterns alone (the dolphin pattern Type 3 or 4 was not used, however), or with the wood-grain paper with a Latin motto surrounded by a narrow strip pattern. Of the wide strip patterns Type 2 is by far the most common keywell flap paper, although Type 12 and 15 also sometimes occur. Because the keywell flap is very narrow the clear shellacked border normally found on the lid is often lacking. If present it is, like the black edging, narrower than on the main lid or lid flap. The Latin mottoes are painted in black Roman capitals on the wood-grain papers. The mottoes seem to have been chosen to suit the space they were intended to fill. SIC / TRANSIT / GLORIA MVNDI, for example is particularly well suited to the main lid of a harpsichord which is narrow at the top and wide at the bottom, and needs words whose length is in proportion to the space available. Virginal lids, on the other hand, usually have 4-word mottoes with words each of roughly the same number of letters. Short 3-word mottoes such as ACTA VIRVM PROBANT are used for harpsichord keywell flaps, and longer 4- and 5- word mottoes are used on virginal keywell flaps. When the mottoes did not quite match the space they were required to fill, extra 'bubbles', 'stars', arabesques or other ornaments were used to fill up any left-over space. The spaces around the mottoes were often filled with motifs similar to those on the soundboard in many Andreas Ruckers lids and lid flaps. The line mottoes used on authentic Ruckers instruments are the following. These do not, of course, include unusual mottoes which have been added to genuine Ruckers instruments by later restorers. Those words in parenthesis are variants and are only sometimes present. Those mottoes marked * are suitable for the large main section of a harpsichord lid. Catalogue of the available hand-made Ruckers papers.